In 1896 a 74-year old American woman arrived in Istanbul, then Constantinople, with a mission to relieve the plight of suffering Armenians. A hundred years ago today the world lost Clara Barton, this remarkable woman, whose relief effort saved at least 50,000 lives. You might wonder how this visionary leader, known by nearly every American school child as the вЂњAngel of the Battlefield,вЂќ came to be in Constantinople. In 1861, Clara Barton worked as a recording clerk at the U.S. Patent Office in Washington, D.C. At the onset of the American Civil War, wounded soldiers from her home state of Massachusetts began arriving in the nationвЂ™s capital; she took it upon herself to care for them. Barton drew on experience she had acquired years earlier when she nursed her brother through a long illness. By 1862 she was on the raging battlefields of AmericaвЂ™s bloodiest war serving its victims. When the war ended in 1865, Barton recognized a need for families to learn the fate of missing loved ones so she led efforts to identify tens of thousands of the fallen. A few years later, Clara Barton traveled to Europe where she joined the nascent International Red Cross movement. She continued serving victims of war and calamity and founded the American Red Cross in 1881. As head of the American Red Cross, Barton directed relief missions in the United States and abroad for twenty-three years, becoming AmericaвЂ™s top authority on humanitarian assistance and disaster relief. This was at a time when American women did not even have the right to vote. In Armenia, those who know of Clara Barton honor her for leading the American Red Cross mission of 1896. Barton wrote that Americans implored her to take action after stories of вЂњthe terrible sufferings of ArmeniaвЂќ hit their newspapers. She departed by boat across the Atlantic to Constantinople a month after her seventy-fourth birthday without any assurances that she would be allowed to disembark. When she arrived, Barton persuaded Ottoman officials to permit the American Red Cross to proceed with its humanitarian mission. Barton and her colleagues spent more than six months assisting Armenians in the region. In cities where victims were dying in overwhelming numbers, her medical teams battled epidemics of typhoid, typhus, dysentery and smallpox. Other relief workers distributed food, seeds, tools and cattle to hundreds of villages. 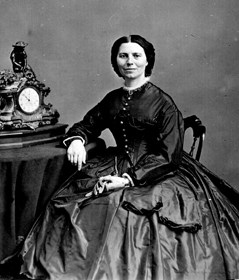 With donations from the American public that would be valued at $3 million today, Clara Barton estimated that the American Red Cross had managed to save at least 50,000 people who in her words would otherwise вЂњhave died of starvation or perished through accumulated hardship before the first of May 1897.вЂќ Countless other lives were improved. In recognition of these efforts, Clara Barton received an award from a Prince of Jerusalem, Cyprus and Armenia and was decorated by the Turkish Sultan. Her work was universally praised because it was based on a common sense of humanity without regard to religious belief. Today BartonвЂ™s legacy lives on in the humanitarian responses to conflicts and natural disasters around the globe conducted by the International Red Cross and Red Crescent. A century after the death of this pioneering woman, we remember Clara Barton as an enduring symbol of American-Armenian friendship who aided those in need and demonstrated what one individual can accomplish through personal initiative and voluntary service. For notification - The AGMI is planning commemorative events dedicated to Clara Barton on May 23. The report prepared by Clara Barton will be reprinted in English and the Armenian translation of the report will be published with the support of the US Embassy in Armenia.